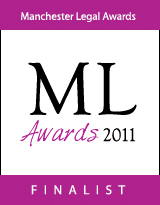 I am delighted that we have been nominated as finalists in two categories for the Manchester Legal Awards (Legal Aid Lawyer of the Year and Small Firm of the Year). It feels very humbling to be chosen out of so many other deserving law firms. I hope that this nomination is a recognition that the work we do on behalf of abuse victims helps some of the most damaged and vulnerable members of our society.